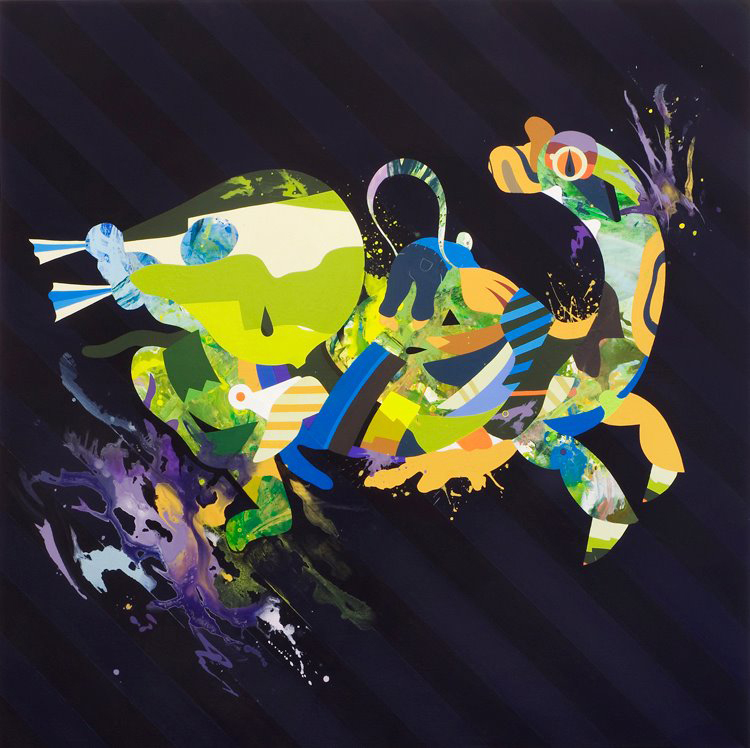 Tomokazu Matsuyama | Kirin (Black Stripe), 2009, acrylic on canvas. 48 x 48 in. Courtesy of the artist. Thematic arts programming abounds during the National Cherry Blossom Festival. In fact, you didn’t need to look too far from the Tidal Basin this spring to find a selection of works by Japanese masters like Katsushika Hokusai (1760–1849), Itō Jakuchū (1757–1766), and Kano Kazunobu (1816-1863), all part of the Smithsonian’s Japan Spring. More relevant to this blog, however, is Japanese-American artist Tomokazu Matsuyama’s Thousand Regards at American University through May 20, timed to coincide with the Cherry Blossom Festival but miles away from the Mall. Thousand Regards is a selection of Matsuyama’s recent paintings and sculpture produced between 2008 and 2011. His forms borrow from traditional Japanese figuration, in particular the adventure narratives of Edo period woodblock prints, as well as from traditional textile design. Compositionally, the works are related to Takashi Murakami’s superflat school — sans the kawaii elements — but they’re also layered with the visual language of American abstraction, drips and drabs lending to the chromatic narrative. This compositional mishmash of cultures and styles, tightly bound by a designer’s deft hand, is meant to reflect not only Matsuyama’s own multicultural upbringing, but also the soft geopolitical boundaries of a globalizing world. Indeed, a shared transnational cultural identity has become part of our contemporary context, and Matsuyama’s work is an attempt to visually define that boundaryless urban ideal as it pertains to his own experience. Within the the context of D.C. and the centennial celebration of the National Cherry Blossom Festival, his canvases also seem to serve as a barometer for the changing geopolitics of a changing century. 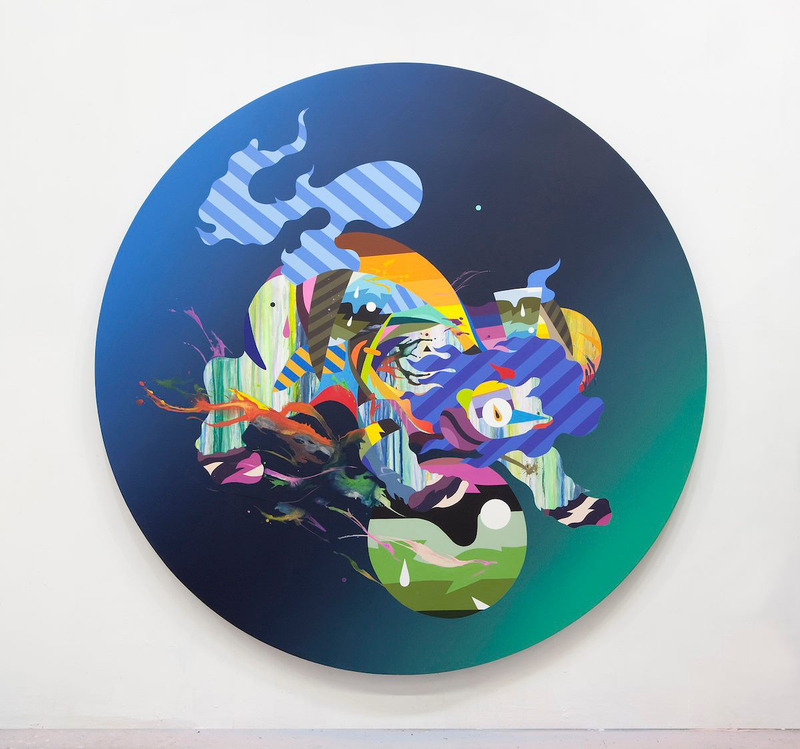 Tomokazu Matsuyama | Mrs. Omega, 2011, acrylic on canvas. 72 in. dia. Courtesy of Joshua Liner Gallery. 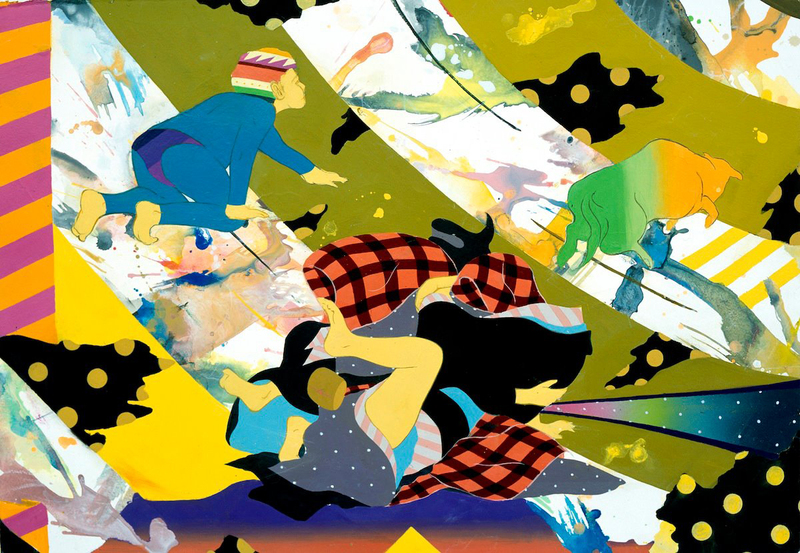 Tomokazu Matsuyama | Mr. Alpha, 2011, acrylic on canvas. 72 in. dia. Courtesy of Joshua Liner Gallery. 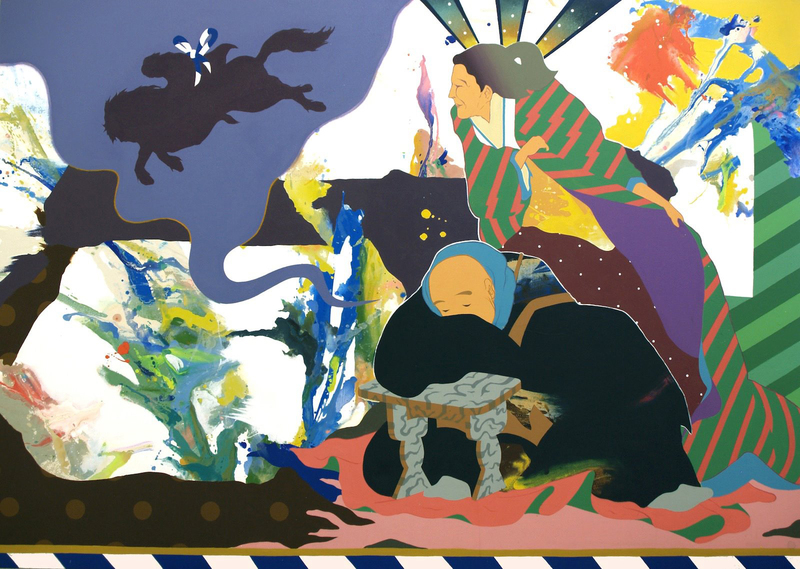 Tomokazu Matsuyama | Dreaming Life’s Journey, 2009, acrylic on canvas. 60 x 84 in. Private collection. 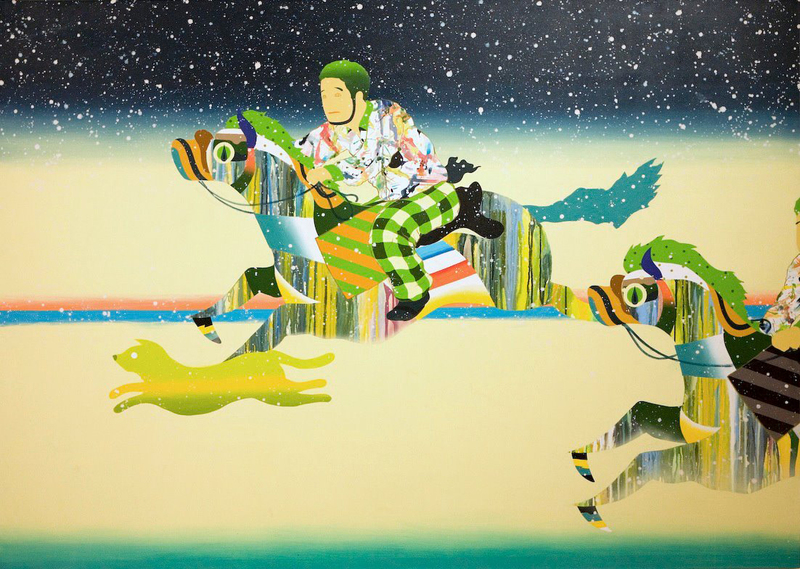 Tomokazu Matsuyama | Runnin’, 2008. acrylic on canvas. 60 x 84 in. Courtesy of the artist. 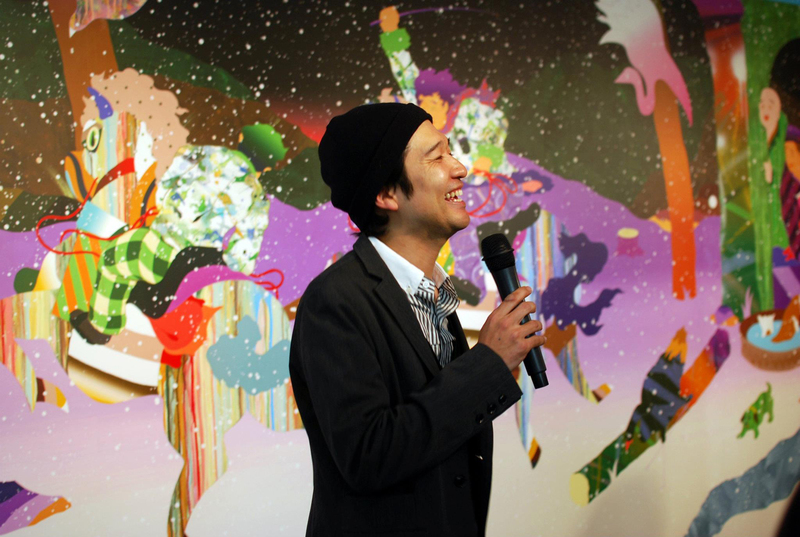 Tomokazu Matsuyama giving a talk at American University Museum’s Katzen Arts Center. Photo courtesy of American University. 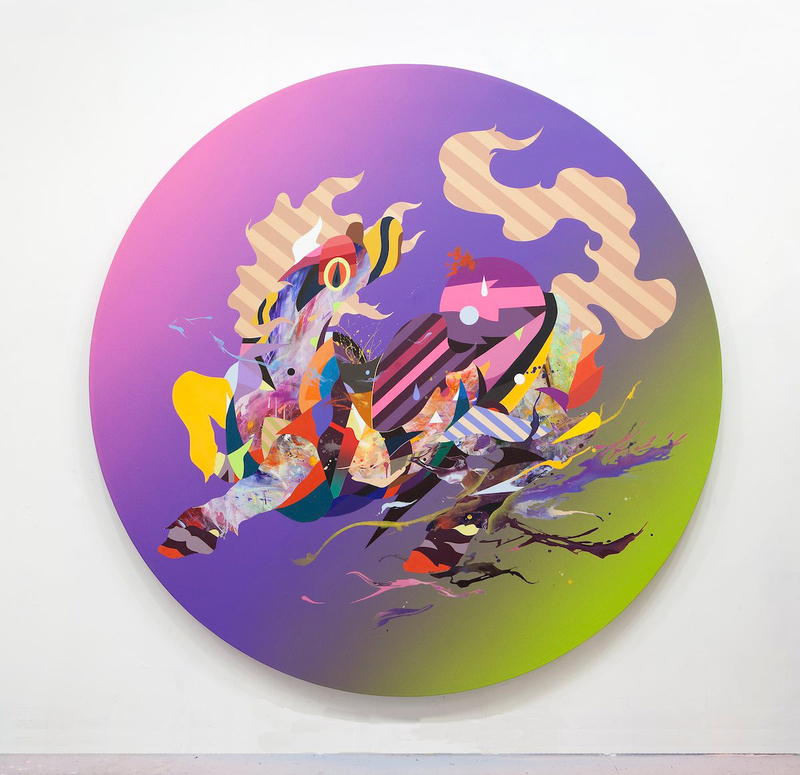 Tomokazu Matsuyama lives and works in NY. He has exhibited internationally showing in galleries and institutions in Tokyo, Osaka, New York, San Francisco, Los Angeles, Miami, and Vancouver. He currently has another solo show on view at Frey Norris in San Francisco and has a forthcoming solo show in LA at Mark Moore Gallery.